John McCain, an American hero that served three decades in Congress, was a republican nominee for U.S. president twice, and a war veteran who survived 5 years as a prisoner in Vietnam died Saturday, August 25th, at the age of 81. McCain was diagnosed with brain cancer in 2017. After receiving surgery for a blood clot above his left eye, doctors discovered the tumor. According to a family statement, McCain turned down any further treatment during his last hours. His wife wrote, “I am so lucky to have lived the adventure of loving this incredible man for 38 years. He passed the way he lived, on his own terms, surrounded by the people he loved, in the place he loved the best.” She tweeted. 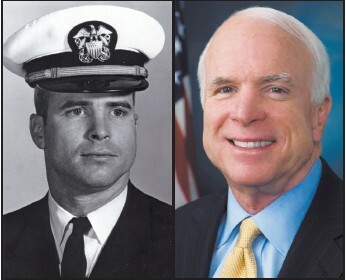 McCain started his political career in 1976 serving as the Navy’s liaison to the Senate. In 1982, he was elected to the House of Representative and a couple of years later in 1986 he won the race to replace Arizona’s conservative. In addition, he also ran for U.S. president twice. In 2000, he ran for the Republican nomination but lost to George. W. Bush. In 2008, he ran again and won the Republican nomination but lost the race against former President Barack Obama. On Wednesday, August 29th, McCain will lie at the Arizona State capital. A public service will be held at 10 a.m. pacific time and a public service afterwards at 2pm. McCain will lie in state in both the Arizona Capitol and the U.S. Capitol Rotunda on Wednesday and Friday, respectively, before his burial at a private service in Annapolis on Sunday, his office said on Sunday. Former Presidents Barack Obama and George W. Bush are expected to speak at McCain’s service at the National Cathedral, though the eulogies have not been officially announced. McCain is survived by his wife Cindy, seven children and five grandchildren.